Water is the basic necessity for all living beings on the planet. Without water, it is difficult for humans, animals as well as the vegetation to survive. 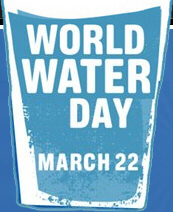 The world is observing the World Water Day on 22nd March. This year the theme is ‘Water and Food Security’. When a billion people in the world already live in chronic hunger and water resources are under pressure we cannot pretend the problem is ‘elsewhere’. Coping with population growth and ensuring access to nutritious food to everyone call for a series of actions we can all help with following a healthier, sustainable diet; consuming less water-intensive products; reducing the scandalous food wastage. 30% of the food produced worldwide is never eaten and the water used to produce it is definitively lost!